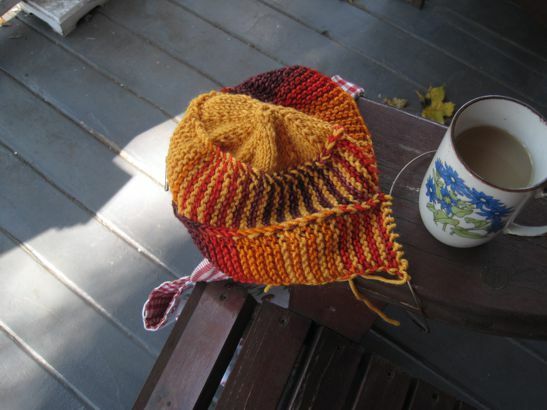 I've been cheating - if I add up my Ravelry projects with the supersecret stuff I haven't listed there - on nine different things this week. Well, last week too. After all my gift knitting over the past few months I've been indulging not just in some spinning but also some hat-making, for me me me. Honestly, I've got to be realistic: right now the weather is still warm, but we are going to be hit with cold temperatures without much notice and there is no point waiting for them to suddenly decide that I need a nice hat to go with my new handwarmers. This has nothing (much) to do with the fact that I'm completely smitten with the concept of spiral knitting. My goal is to keep striping the two yarns I'm using so as to stretch out the one I used for the handwarmers, switching back to the handwarmer yarn just in time for my forehead and the finish. I can live with scratchy yarn at the back or the top of a hat, but it is just so depressing to be slogging through slush in cold wet winds and to have an itchy forehead too. Well, I guess there are two goals. 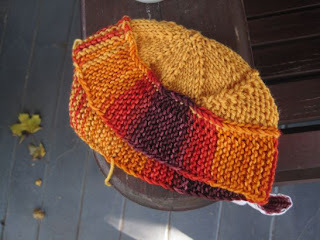 The other is to do this expertly on the first try so I don't have to frog back and reknit. And if I pull that off, I'll go back to one of the other projects I'm cheating on. Promise!